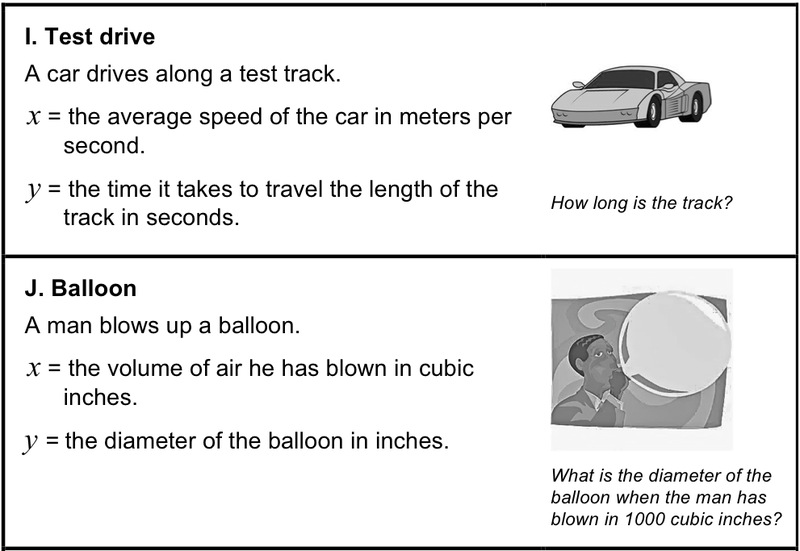 Before the lesson, students work alone on a task designed to reveal their current understanding. You review their solutions and create questions for them to consider to help improve their work. In the lesson, students work in small groups on a collaborative task, matching situations, sketch graphs, and algebraic functions. They refine the graphs and interpret the formulas to answer questions. Students then discuss as a whole-class what has been learned and the strategies used. In a follow-up lesson, students review their responses to the original task and the questions posed. They use what they have learned to complete a similar task; Another Four Situations. Each student will need a copy of Four Situations and Another Four Situations and a mini-whiteboard, pen, and eraser. Each small group of students will need cut-up card sets: Everyday Situations 1, 2, and 3; Graphs 1 and 2; and Algebraic Functions, poster paper, glue, and a graphing calculator to check answers. There is a projector resource to support whole-class discussions. You may also want to copy the card sets onto transparencies to be used on an overhead projector. Approximately 20 minutes before the lesson, an 80-minute lesson (or two 45-minute lessons), and 20 minutes in a follow-up lesson.